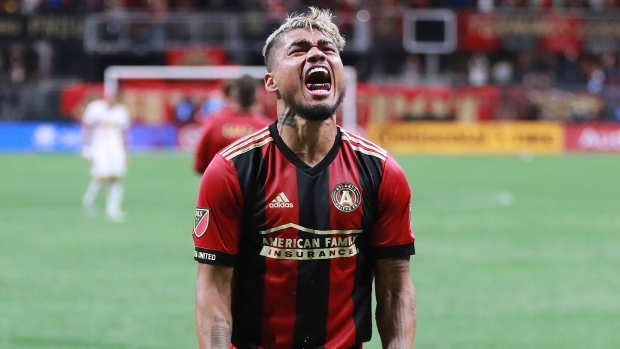 ATLANTA — Josef Martinez claimed the MVP award from Major League Soccer on Wednesday after shattering the record for goals in a season and leading Atlanta United to the championship game. The 25-year-old Venezuelan striker received his Landon Donovan trophy during a ceremony at the headquarters of United owner Arthur Blank. Martinez already earned the Golden Boot for scoring 31 goals in 34 games this season, breaking the mark of 27 shared by Roy Lassiter, Chris Wondolowski and Bradley Wright-Phillips. "I'm very happy because this is an award we all wanted," Martinez said through a translator. "It is due to a lot of work by myself, my teammates, my coaching staff and my family. I just want to thank all those people." He credits his teammates for giving him plenty of scoring chances, including fellow MVP finalist Miguel Almiron. The other finalists were Zlatan Ibrahimovic of the Los Angeles Galaxy, Wayne Rooney of D.C. United and Carlos Vela of Los Angeles FC. "If it wasn't for all those guys, all the passes they assisted me on this season, the spectacular year that all of them had, we wouldn't be talking about this award or talking about Atlanta United playing in the final," Martinez said. He has added three goals in the playoffs. Atlanta won the Eastern Conference title and will host the MLS Cup final on Saturday night against the Portland Timbers. The MVP is eager to add one more trophy to his collection. "We want to be champions," Martinez said. "We've been working two seasons for this opportunity. We don't want to let it slip away." After coming to Atlanta United from Torino in Italy's Serie A, Martinez made an immediate impact with the MLS expansion team in 2017. He scored 19 goals in 20 league games and might've broken the scoring record if not for a quadriceps injury that kept him out for two months. He was hurt while playing for the Venezuelan national team. Atlanta coach Tata Martino came into this season with high expectations for the diminutive striker. "When I rejoined the team in February, there was a meeting between myself and Tata," Martinez recalled. "Tata told me all I have to do is find space and I could score 30 goals in a season. At the time, I didn't believe him. Sometimes people say things, but you don't expect it to come true. Thanks to everyone, I was able to do it." Martino will be coaching his final game with Atlanta in the MLS Cup. He is expected to take over at Mexico's national coach. "I just wish him the best wherever he goes," Martinez said. "Maybe we'll reconnect in the future." Martinez said he keeps his Golden Boot trophy on a table at his home, surrounded by game balls. When asked what he plans to do with the MVP award, he couldn't resist having some fun. "I'm going to put it on top of my car," he joked, "so when I leave my house, everybody can see it every day."